Being a dog I rarely take a note of my meanderings, sometimes it is after the cat; at others the mail-man but I keep roving. There is a pleasure in losing oneself to the serpentine paths of Himalayas. Take the word of this canine connoisseur – No fragrance bottled in ruby red and exotic name comes close to the wind that caresses rhododendron tree in full bloom. Perhaps Ruskin Bond knows what it feels like. 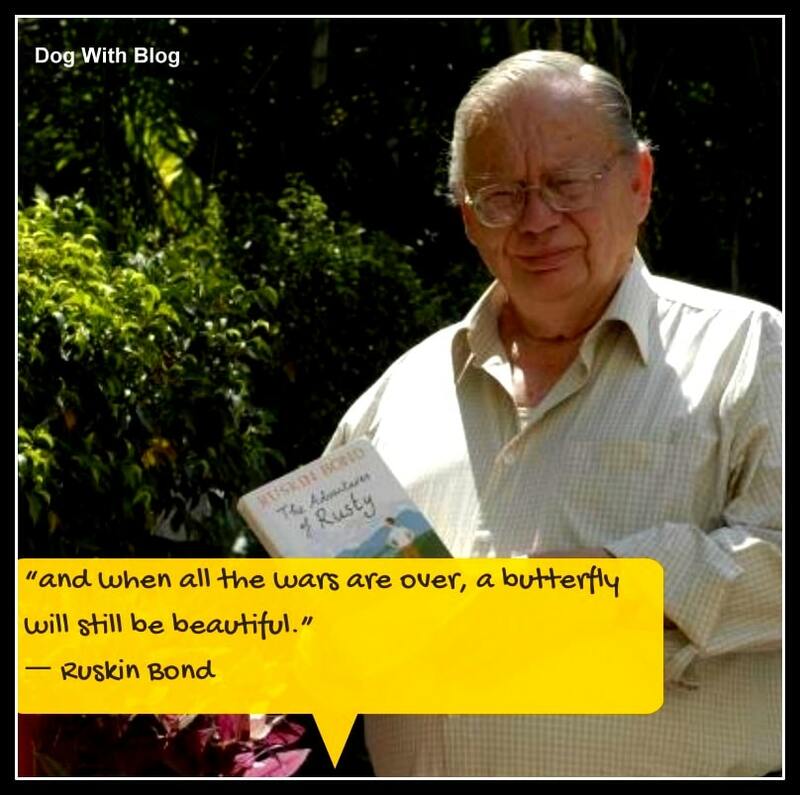 Ruskin Bond remains the last of the poets who know the true meaning of life and love and peace. Tolkien was right. not all those who wander are lost. Some, like Cathie, discover themselves. Anyone visiting Nepal will no doubt recognize the overpopulation of stray animals. There’s an overabundance of stray dogs and cats wandering the streets that have sustained injuries from vehicles or abuse from humans. The most common zoonotic disease seen in these animals is the life threatening virus rabies. Since my arrival at the center in May 2012 I have had the privilege to work with wonderful volunteers and staff members who dedicate their time effortlessly to make a difference. We all had our hearts woven with the solo song to help and provide comfort to these sick and injured animals. Animal Birth Control or ABC as they call it at the KAT center is a cardinal program and has been proven to reduce the stray overpopulation of dogs in the Kathmandu region since 2006 with the staggering number of 36,000. Currently the numbers have reduced to 22,000 roaming dogs in the streets of Kathmandu alone. Every animal that comes through the doors of the KAT center is sterilized, tattooed and vaccinated against rabies before they are released or in some cases adopted. There are many cases of HBC’s (Hit-by-car) including dogs that have laid on the side of the road with fractures for an undetermined period before a Good Samaritan takes the initiative to transport them to the center. Unfortunately for most of these dogs as the days go by the extent of their injuries and damage to organs could not be reversed. How to help animals in Nepal? These Vet students from far west show you how all it takes for helping animals in Nepal is a loving heart. Thus far, empirical diagnosis is the way to go due to the scarce resources and lack of diagnostic tools. Accurate diagnosis is very limited therefore treating appropriately is very challenging. This is expected for the reason that the KAT center is a non profit organization based in a developing country. Unfortunately the center does not have the capacity to take in more than 50 dogs at a time. That is a very small number considering the amount of dogs roaming the streets that require some form of medical intervention. Adoptions are always an option but this is scarce in Nepal due to cultural beliefs. Community dogs are common in Nepal as the locals feed them however the majority of dogs are not as privileged and are seen scavenging through garbage for any food scraps. Contrary to popular belief, most of these stray dogs are not aggressive. When approached in a gentle manner they wag their tail and seek for some attention (they roll on their backs and love to have their bellies rubbed). It was amazing to have experienced all this love from people and animals in Nepal and I hope more people would turn up to do their bit. We all need not be a vet or write cheque for donation. Efforts like providing for food or a make shift arrangement to brave the weather or sterilizing through municipality/NGO help also go a long way. KAT centre is doing truely a remarkable job in helping the poor animals and giving them a better life. In a way, they are making a better society. I am a veterinary student in Nepal and i myself am thinking about volunteeting over there. Hope to aid the people at KAT in what they are doing. name, which shares a similar coat. Next Next post: You need to know this three-legged dog and his best friend!